Die Tour beginnt um 13:45 h am Wiesenhüttenplatz 39 in 60329 Frankfurt. Nach der 1-stündigen Rundfahrt in unserem Doppelstockbus fahren wir anschließend zum Rhein, Abfahrt 15:15 h wieder an unserem Abfahrtsbüro. Für die 1-stündige Rundfahrt ist ein Audioguide in verschiedenen Sprachen verfügbar. Die Halbtages-Rheintour wird von einem englisch-/deutschsprachigen Tourguide begleitet. Die Tour wird angeboten vom 13.04.2019 bis 03.11.2019. 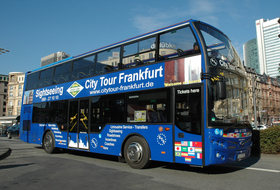 This tour combination will start off with a 1 hour panorama round trip through Frankfurt on a double decker bus with explanations via earphones. We show you the diversity of our historic and modern metropolis: the most important sights of the former Coronation city of the German Emperors and the modern European Banking Center. See one of the largest European rail stations, the Museum Embankment, European Central Bank and the banking quarter with its skyscrapers - among them the biggest office buildings in Europe. We also pass by the historic heart of the city called "Römer" - our famous old city hall, the Paul´s Church, the Cathedral and the reconstruction of the "new old town" part, reopened after many years of reconstruction. See the "Hauptwache" - former headquarters of the city´s Stadtwehr militia, our shopping street "Zeil", the Old Opera, the big towers of the former city wall and our international fairgrounds. Leave Frankfurt and - accompanied by a guide - continue to the Rhine River Valley - an area UNESCO counts to the World Heritage of Mankind: vineyards, charming little vineyards, villages and mighty medieval castles more than anywhere else in the world. Take a boat trip on a Rhine steamer alongside the famous river panorama up to Kaub, followed by a wine tasting in a little tavern. In a lovely restaurant right by the riverbanks you will enjoy a lovely dinner which is also included.